The International Energy Studies Group recently announced the release of a new Berkeley Lab study that will improve the energy efficiency of room air conditioners. 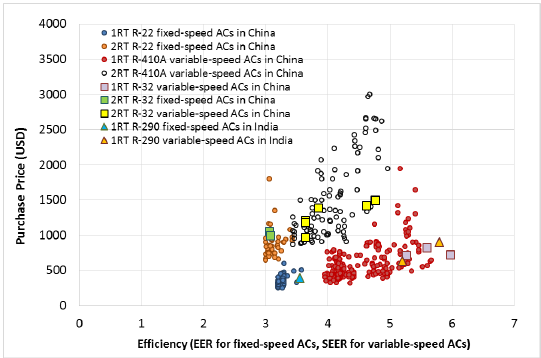 "Assessment of commercially available energy-efficient room air conditioners including models with low global warming potential (GWP) refrigerants" reviews improvement of energy efficiency of room air conditioners (RACs) while transitioning to low global-warming-potential (GWP) refrigerants, which will be a critical step toward reducing the energy, peak load and emissions impacts of RACs while keeping costs low. The report describes research performed to identify the best-performing (i.e., most efficient and low-GWP-refrigerant using) RACs on the market, to support an understanding of the best available technology for market transformation programs for high efficiency, low-GWP equipment such as minimum energy performance standards, labeling, procurement, performance assurance requirements for imports, and incentive programs.